Have you caught the Screen Sensation bug yet? Over the past few weeks the children and I have been having some fun getting acquainted with it. So far we’ve come up with 9 projects, and I have many more in mind (see our list below)! Before I get ahead of myself, let me tell you how we’ve been using this craft kit. Screen Sensation kindly provided us with a 12×12 kit and a couple of extras to get us going on some cool projects. I am going to be completely honest with you (as I always am)…I had so many ideas and things that I’d like to do with this product that I froze a little when it arrived as I didn’t know where to begin or which project to try first! I just wanted to do it all at once and became overwhelmed. We wanted to give you a good sampling of what this can be used for, and how it can be used not just by adults, but by children as well (under adult supervision, of course). There are so many more possibilities, but we’ve started out simple so we can involve the children. We’ll progress as they gain more experience. We were also able to choose two screens of our choice, as well as an additional three inks. Screen Sensation must be a very popular item as our first and second choices of both were sold out, so we choose some alternate screens and inks. Since we chose our screens, a whole new range of designs have been added….and oh, they’re so very tempting! We followed the instructions in the booklet, and I also watched a few videos on line to see it in action. In fact, you may have seen Screen Sensation on Create and Craft. Getting started is very easy…and I do strongly suggest you cover your work surface and wear old clothes or an apron as well. We’ve had a few close calls and the kids thought I was crazy when I said not to jump around the kitchen because I didn’t want paint on our ceiling….and 10 minutes later we came awfully close…luckily it was only the chair that received the recoat of paint…and the good news is that with a quick wipe it didn’t leave any permanent damage. Yes, working with children can be a challenge at times…and doubly so as I tend to be a bit of a clutz as well. But this just proves that if we can use the Screen Sensation, most anyone can! Choose the screen you want to use and centre it on the part of the frame that slides out of the base. I will note that although the frame looks large, the printable area of the screens doesn’t take up the whole space. 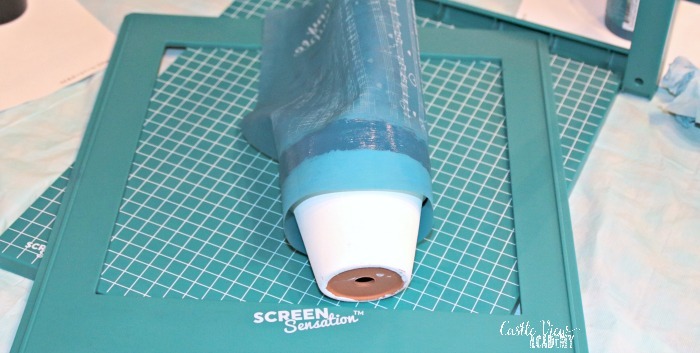 Use the SS masking tape (you can reuse it a few times on the same day to make it last longer) to affix the screen to the frame. Then flip the frame over and slide it into the base and you’re good to go. Then place your paper onto the base, again you can use a little of the masking tape to hold it in place if needed. You may have to do a little adjusting to make sure your project is in just the right spot before you secure it. 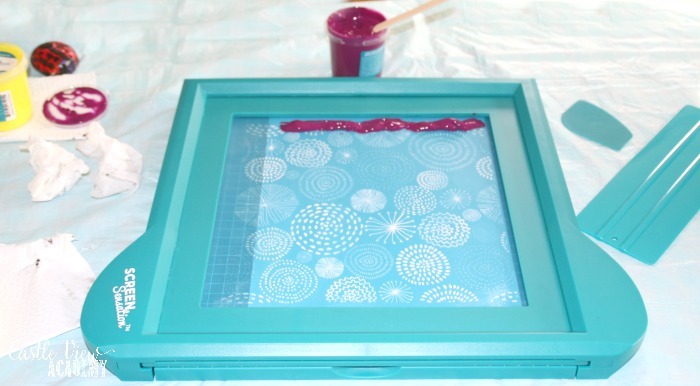 When you’re ready, close your base firmly then add some paint along the top of the frame. You can add a single colour, mix a custom colour in the mixing pot, or even use a couple of colours for a groovy effect. Then use the large squeegee at a 45 degree angle to pull the paint across the screen all the way to the bottom. Tristan is giving a good example below. Sometimes it was tricky for the children’s smaller hands to apply an even pressure across the entire squeegee and it was left a bit blotchy. When this happened I helped them go over the screen again to ensure even coverage. It does get easier with practice. I also found it easier to use when I had someone near to hold the frame down steady while I was using the squeegee. After you have used the small squeegee to gather up all that yellow paint you can see at the bottom of the picture of Tristan using SS, then carefully but fearlessly lift the frame and you will see your masterpiece below. In the lower pictures you can see that the design doesn’t cover an A4 piece of paper from top to bottom, but it is a little wider than the paper. Should you go past the paper and end up with ink on the base plate, simply grab a baby wipe quickly and wipe up the paint and it won’t stain. If you leave it too long, it will stain but it won’t affect the use of the product. It’s that simple! Clean up isn’t difficult, but I would suggest you don’t have your dishes soaking in the sink when you do this. 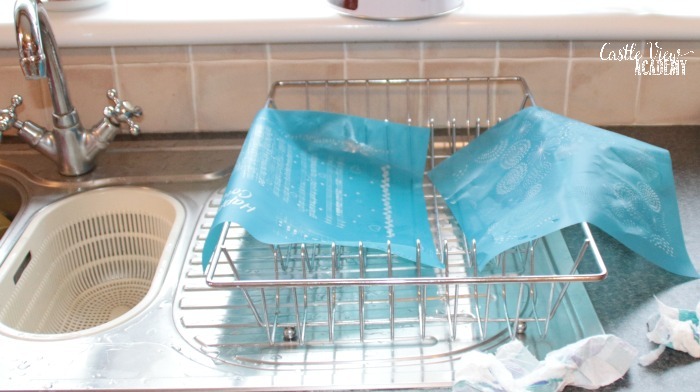 Depending on the day, I either used the dish rack to hold the screens after I’d rinsed them with cold water, or I placed them flat on a tea towel. My wish is that the original plastic sleeves that the screens come in would be more robust so that they can be more easily re-used for storage. We’re in the process of creating tutorials to share with you the details of how we created many of these projects, so keep reading our blog over the coming weeks to learn more about these projects, as well as others we have in the works. 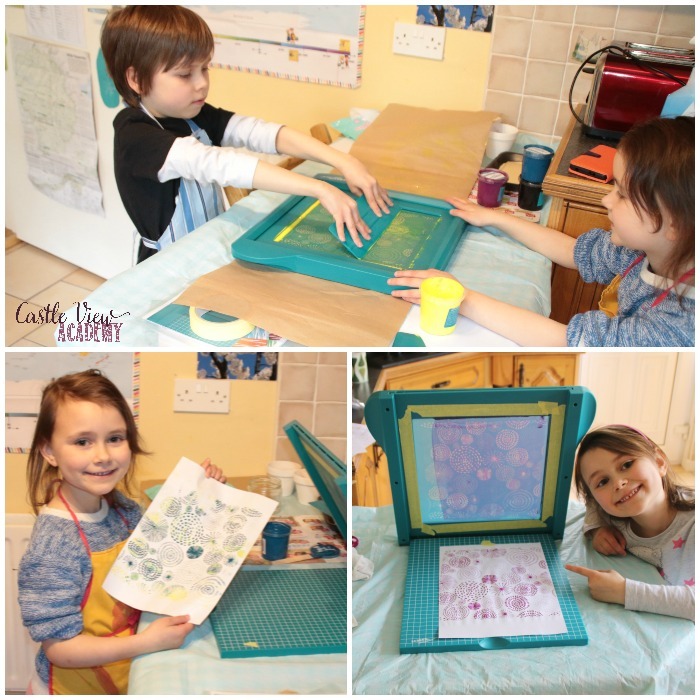 This was our first time ever screen printing and we started off slow with lots of practice on paper with the different screens and colours, getting to know how it works. we picked up some experience we became a little more daring. Here’s a collection of some of the projects we’ve been working on. We have more projects on the go that we will also be sharing with you over the summer. With all of the practice papers we made, we turned them into some cute little envelopes that will hold tiny notes to family or be sent overseas to pen pals. In the photo further up you can see Tristan printing on a long piece of brown paper. First he applied yellow and then the next day he printed over it again in blue. He thinks the results look like fireworks! He folded the paper and used the Japanese way of creating a perfectly-fitting book cover for an old book he is reading. We’ll show you the folding technique in a future blog post. There is a way to match up the screen designs…but Tristan wasn’t too worried about that so you can see the ‘joins’ of the screen. The next project we did was to put the abstract circles on a canvas board first in yellow, and then we used the Kaleidoscope Screen with Berry colour over the top. SS does have some glitter you can purchase, but we used some embossing glitter we had at home already and gave it a try over a few random butterflies and then used a heat gun to set it. It wasn’t perfect on our first attempt, but Kallista says it’s perfect to her and has the canvas by her bed. With a little more practice, and using an anti-static surface, I know it would be even more wonderful. This is a project we did after some practice. The SS unit wouldn’t close with the canvas bag on it, so what could we do? I removed the frame and Tristan helped hold it in place while I simply used a flat paintbrush to paint over the butterflies. We used each of our 3 colours, and then did some colour mixing and some rainbow effects on some of them, too! It looks really lovely and the bag is practical for carrying large pieces of post. 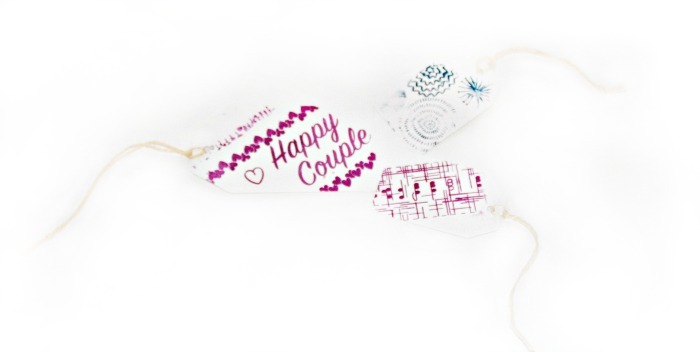 Gift tags were simple to make. 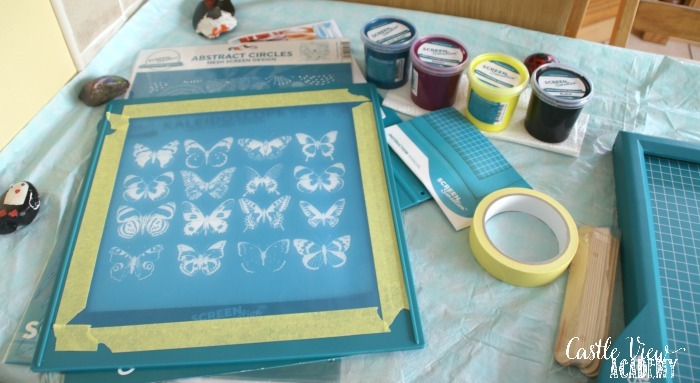 You could screen print a larger piece of paper or fabric for some beautiful gift wrap to match as well. 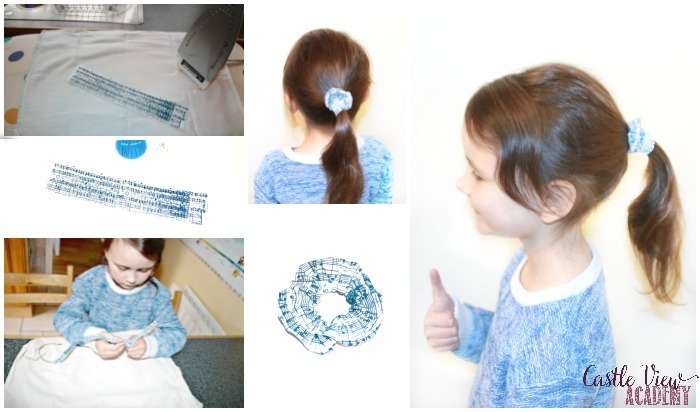 Kallista made a beautiful hair scrunchie with the A Gift For You screen. She printed it on some cotton, sewed it herself and rolled it the right side out. 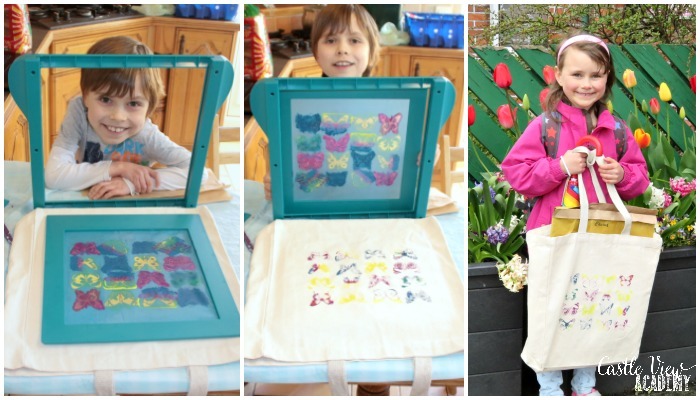 It’s worked so well that she’s going to be making more in the other designs and colours – one for every outfit! We’ll be sharing a tutorial of this project with you in the near future, so keep watching. In case you were wondering, yes, the SS paints can be heated with an iron (one the reverse side) to make them permanent. We did the same with the canvas bag. 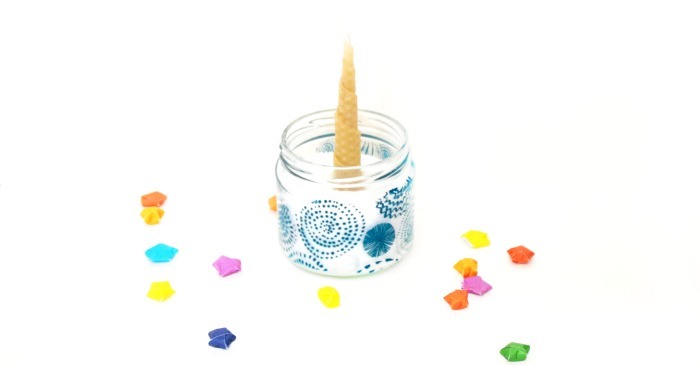 This candle holder was made using a paint brush with the screen taped to the jar as well. After you leave the SS paint to cure for a week, you should be able to wash it with your regular dishes. Doing projects on glasses and vases would be so fun for a wedding or birthday! This jar simply holds a beeswax candle the children made. A little tea light also looks pretty. Or fill your jar with colourful candy and take it in to work to share. Personalise and get creative with your phone case! A long while ago I placed an online order for a camera filter and this orange phone case is what I received….it isn’t even compatible with my mobile…I had an idea of how to upcycle it, which you’ll see in the near future. It was a good idea, but the case was still boring. Along came Screen Sensation…and I’ve added a couple of little butterflies to the case to make it more interesting. I may paint the butterflies, but I’m not certain of that yet. 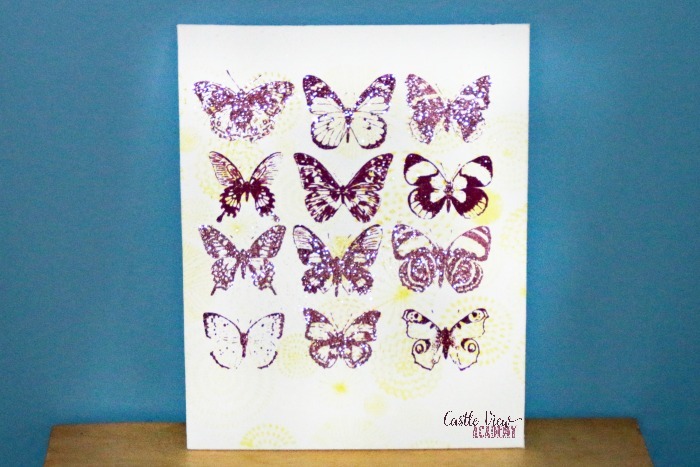 Paint the butterflies? Yes, you can take a little SS paint and thin it out and use it like you would acrylic paint. There are people purchasing SS and creating beautiful items that they are selling at craft fairs! What a wonderful idea! I can’t guarantee we will do this, but my children are looking for ways to earn their own money and and this could be one way for them. We will have to look into the associated costs of doing this. I’ve heard it said that Screen Sensation is a business in a box, and yes, it certainly could be; turn your hobby into something that will bring pleasure to others, too! I’ll leave you with this work in progress; a painted flower pot with the rim painted with music notes. The rest of the design is still yet to be decided. There are suggested ways to use the SS to print on round items, but I didn’t have success with them so I tried taping the screen directly to the items and used a flat paintbrush. For me, this was the most successful way for me to get things done without smudges and frustration. It’s also possible to do it this way with only one set of hands instead of needing someone else to help. If you’d like to know more or would like to follow Screen Sensation, you can connect with them through their website, Facebook, Pinterest, and Instagram. 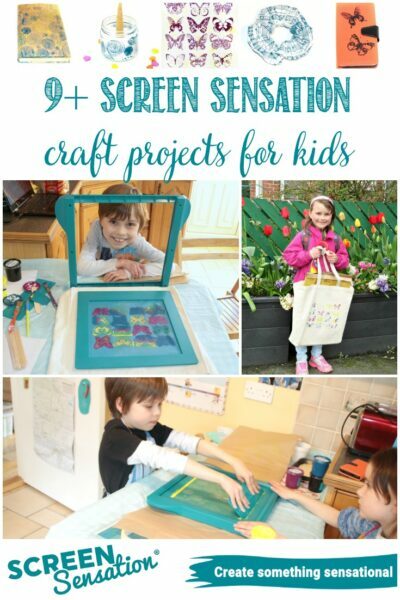 You can also purchase Screen Sensation products through Create and Craft and Crafting.co.uk. 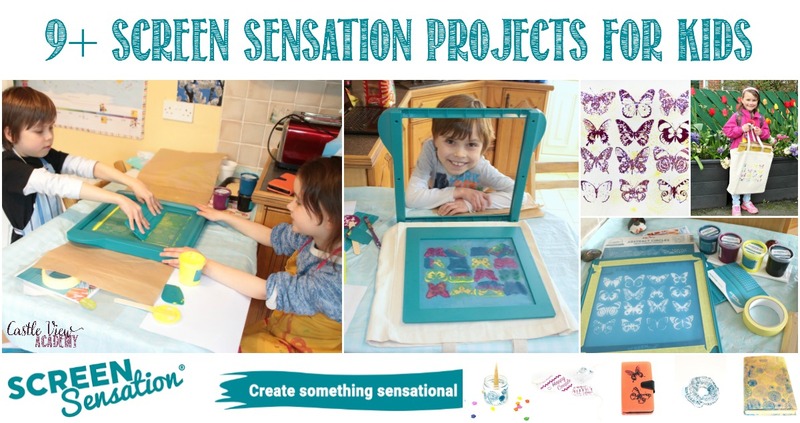 Screen Sensation kits also come in a 7×5 kit, a stamp adaptor plate is available for those who want to use a different technique, and if you’re really crafty, you can even create your own bespoke screens at home!